6 Aug, 2018 in art / comfort zone / creativity / income / leadership / monday-motivations / sales by Minette Riordan, Ph.D. I have a question for you: are you showing your work? I had this aha moment earlier this summer when I was looking at my numbers and realizing I wasn’t making as much income as I had planned on because I wasn’t actually offering anything for sale. I wasn’t making it easy for people to buy from me – on either the business coaching side of my business or the art side. Wait, what, the art side of my business? Yep, that’s right. I sell art. Or at least people have been asking me if they could buy my art, did I have a website where they could see more. It’s coming, I said. FOR SIX MONTHS. I even sold two pieces without trying. But the truth is, I was hiding out, retreating, not being my normal courageous risk-taking self. “How hard can it be?” is one of my favorite mantras when it comes to building business. And yet, I procrastinated, threw up roadblocks and told myself and others all kinds of stories about what was holding me back. I took my own advice and decided I needed to make this a simple as possible. I needed to show my artwork and let go of my fear and any attachment to outcomes. Selling high dollar coaching packages. Easy! Selling a piece of my heart – my art? So tough. Who knew? Where in your business are you hiding and afraid to show your best work? This week I challenge you to share one offer with your community. Make a post on Facebook or email a few people and let them know what you have for sale. Invite a group of girlfriends over and tell them about it. Show your work! Showing your work is the next most important step for many of you on your business building journey. Are you willing to take this courageous step with me? P.S. If you are curious and because I am practicing what I preach, you can check out my artwork online here: http://minetteriordan.com/art/. 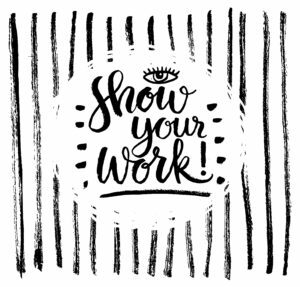 Need a place to show your work? Come share in our Facebook group this week. No sales pitches allowed, practiced sharing from your heart what you are creating and why. I will be waiting for you there. ← [Monday Motivation] I see your magnificence, do you?